New for 2014! 12' x 25' Private Pool, four bedrooms and three and a half bathrooms. 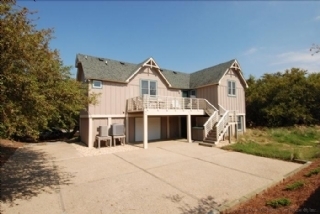 Located in the quiet, wooded community of Southern Shores, this comfortable Outer Banks vacation home has been lovingly maintained and boasts all the amenities and conveniences of its larger counterparts. Live oaks and a woodland setting provide a tranquil vacation spot, while area beaches lie just a block away. Level 1: Master Bedroom (King); Bedroom (Queen); Bedroom (Queen & Bunk); Den with Futon, flat screen TV/VCR and PlayStation II, dart board and deck access; full hall bath. Level 2: Master Suite (King) with private sitting area, TV and whirlpool tub; large great room surrounded by picture windows, flat screen TV with DVD/VCR, stereo with surround sound and private deck access; Kitchen complete with a gas stove for the serious cook in the family; built in computer work station and WIFI internet access; rear exit just off the kitchen leads to a large deck with gas grill and picnic area; laundry area; half bath. Level 3: Loft area complete with flat screen TV/DVD/VCR and access to third level private deck and hot tub.